Kubuntu is an Ubuntu-derived distribution. 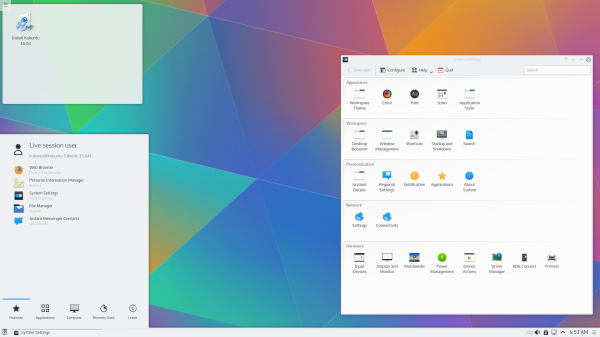 The Kubuntu CDs are made up of Ubuntu's base plus KDE. You can get exactly the same effect by installing Ubuntu and adding the KDE packages from the Ubuntu archives. Ubuntu is a Linux distribution with a fast and easy install, regular releases, a tight selection of excellent packages installed by default, every other package you can imagine available with a few clicks, and professional technical support from Canonical Limited and hundreds of other companies around the world. Ubuntu is based on the debian distribution with enhancements to make it easy to work with. The Desktop version is a Live CD with installation available from the desktop, while the alternate version provides a text based install approach.